Ozhotels is a group of independently owned and non-related hotels, motels and serviced apartments offering discount accommodation across Brisbane Australia. Oz hotels is not an internet travel agent. Oz hotels allows you to deal directly with the apartments or hotels with absolutely no agent involvement giving you the best possible rates for these hotels / apartments. Why deal with a travel agent when you can book your accommodation online directly with these Brisbane apartments / hotels and save! There is lots of accommodation in Brisbane to choose from with an extensive range of fully self contained serviced apartments, hotels, motels and B&Bs. 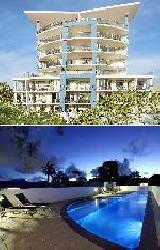 This wide choice can make it quite difficult and time consuming to find the most appropriate property for your needs. This is where an accommodation expert like OzHotels becomes very handy. They allow you to compare hundreds of different properties located right across Brisbane in order to find the one that meets your requirements, as well as your travel budget. The main advantages of booking online with OzHotels is that you can book your travel up to 12 months in advance and that you will be able to get an extra discount off the already cheap rates the longer that you stay. So the next time that you are taking a business trip or holiday to Brisbane why not save yourself lots of time and money by booking directly with OzHotels, the discount accommodation experts. The Hub Apartments are ideally positioned in Spring Hill and provide a wide range of affordable 1, 2 & 3 bedroom self contained serviced apartments in the heart of Brisbane. Ideal for leisure guests and business corporate travellers The Hub Apartments are conveniently close to Fortitude Valley and only minutes from the Brisbane city centre. 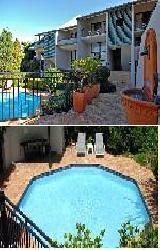 The Hub Apartments provides all types of travellers with discount accommodation in Spring Hill. It also features a wide range of modern amenities and services such as direct internet access, faxing facilities, lift, restaurant and baby cots available for hire. 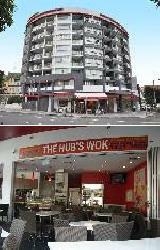 The Hub Apartments Brisbane caters for business and leisure guests with an on-site cafe, on site Wok Asian Restaurant, award winning Raven Hair Salon, on-site management, weekly servicing and fee pay car parking. The Hub Apartments Brisbane offer exceptional value for money, providing quality apartments accommodation in a great Brisbane location. For great value apartments in Brisbane, close to the city centre and the famous Gabba cricket ground stay at the Kangaroo Point Holiday Apartments Brisbane. These stylish 1 and 2 bedroom apartments range from 3½ to 4½ stars and are ideal for both families and business people staying in Brisbane for a long or short stay. The very affordable apartments feature all of the facilities that you will need to make your accommodation in Brisbane pleasant and enjoyable. 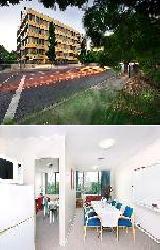 Also the facilities at the Kangaroo Point Holiday Apartments include 2 swimming pools and a BBQ area that guests can utilize. With public transport at the doorstep and the Brisbane casino, many restaurants, cafes, pubs, shops and the South Bank parklands only a short walk away the Kangaroo Point Holiday Apartments Brisbane really is the ideal place to stay. The modern serviced apartments that are provided by the many Quest Apartments in Brisbane are perfect for both corporate and leisure travellers seeking comfortable, yet affordable accommodation in Brisbane. The Quest Apartments have a variety of different properties that are conveniently located in superb city locations, which are just a short distance from Brisbane's business, cultural and entertainment districts. With luxuriously appointed studio, 1, 2 and 3 bedroom apartments featuring a fully equipped kitchen and laundry, private balcony and many other modern in-room features, as well as the use of hotel style facilities the Quest Apartments are the ideal Brisbane accommodation for both families, couples and individuals. If you don't feel like cooking yourself you can also take a short walk from your apartment to one of the many shops, al fresco cafes, restaurants, bars, markets and food halls that Brisbane has to offer. The Mantra on Queen Apartments Brisbane (formerly Pacific International Apartments) provides beautifully appointed, spacious apartment accommodation boasting panoramic city or river views right in the heart of Brisbane CBD. A short walk from the Pacific Apartments Brisbane is the Fortitude Valley business district, Chinatown, numerous restaurants, shopping and entertainment venues. 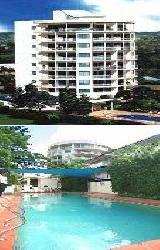 The Mantra on Queen Apartments Brisbane offer a high level of sophisticated and stylish apartments. These studio, 1 and 2 bedroom Brisbane apartments are extremely spacious and feature a fully equipped kitchen, King size beds, balconies, air-conditioning and in-room data ports. 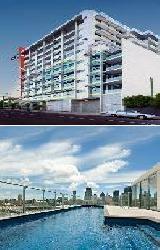 Guests staying at the Pacific International Apartments Brisbane will appreciate the world class recreational amenities which include a rooftop swimming pool, gymnasium, sauna, spa and undercover security car parking. The prominent 30 storey tower that is the Mantra on Queen Apartments provides the ideal Brisbane accommodation for business and leisure travellers. Not only is the Brisbane city centre so close, but our serviced apartments are also close to Brisbane Convention & Exhibition Centre, Brisbane Cultural Centre, Brisbane Performing Arts Complex, Casino and the Gabba Cricket Ground. 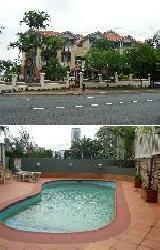 This makes Toowong Villas the perfect place to stay for either families or executives. 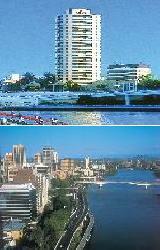 The Riverside Apartment Hotel Brisbane is situated in the Southbank district of Brisbane, which is within the Central Business District of Brisbane. Only a short walk from the Riverside Hotel Southbank is the Brisbane Convention Centre, Treasury Casino, Queen Street Mall, Queensland Performing Arts, State Library & Cultural Centre, Southbank & Roma Street parklands and an enourmous selection of fantastic restaurants, cafes, bars and theatres. The combination of a convenient Brisbane CBD location and your choice of 1 bedroom apartments or hotel style rooms makes the Riverside Hotel Brisbane the ideal accommodation for both corporate and leisure guests. The facilities at the Riverside Hotel Brisbane include a refreshing swimming pool, free secure car parking, guest laundry, dry cleaning service, daily housekeeping, balconies above the first level, air-conditioning, direct dial telephones and hairdryers. 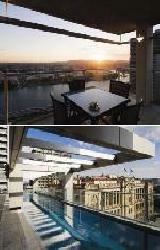 The Riverside Hotels signature restaurant features a delicious selection of Australian and contemporary cuisine. 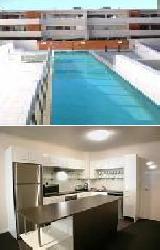 Alternatively you can take advantage of our apartments cooking facilities and design you own appetizing meals. All of these facilities are designed to offer you the perfect business or holiday accommodation in Brisbane, and to make your stay in Brisbane as comfortable and enjoyable as possible. The Oaks Casino Towers is perfectly positioned in in one of Brisbane's most significant historical precinct and provides business and holiday travellers with wonderful views. This luxury Brisbane property consists of fully self contained and stylish 1 & 2 bedroom apartments that have views of either the Brisbane city or the the Brisbane River and South Bank. Guests staying at the Oaks Casino Towers cantroll through the city's Botanic Gardens or across the river to South Bank with it's beach, museums, art galleries and theatres. Guests can also take advantage of the nearby shopping, entertainment and cafe precincts that are right on the doorstep of this affordable Brisbane accommodation. The Oaks Casino Towers Apartments has a spectacular 25 metre glass-walled swimming pool, fully equipped gymnasium, on-site car parking, 24 hour reception, heated spa and furnished sun deck. Oaks Casino Towers sets a new standard in Brisbane apartments, successfully encapsulating all the finest elements of inner city living. The Capitol Apartments provides a selection of 4 star 1 & 2 bedroom modern, self contained serviced apartments that have all the comforts of home. The Capitol Apartments are situated in the heart of South Brisbane and is ideal for business travellers and leisure guests alike. Centrally located, close to all that Brisbane has on offer, The Capitol Apartments are 300 metres from the Brisbane Convention & Exhibition Centre and a 5 minute walk from South Brisbane Train Station. 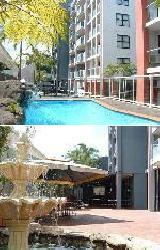 The Capitol Apartments provides all types of travellers with discount accommodation in South Brisbane. It also features a wide range of modern amenities and services such as disabled facilities, guest laundry, fitness equipment, lift, outdoor swimming pool and day spa. 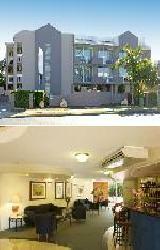 Business facilities at the Capitol Apartments in South Brisbane include WIFI internet access and conference facilities. The Capitol Apartments symbolise connectivity, facilitating an integrated lifestyle, where nightlife, health and relaxation converge, offering the perfect synergy to a hectic schedule in vibrant Brisbane. 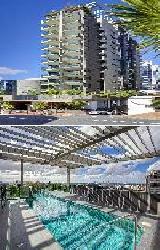 Enjoy the spectacular views of the Brisbane River from the Park Regis North Quay Apartments Brisbane. These Brisbane apartments are located in the heart of the city centre and offers convenient access to the CBD, Brisbane convention centre, Southbank precinct and Roma Street parklands. Also only a short walk away is Brisbane's Suncorp Stadium. 'On Quay' the recently refurbished restaurant at the Park Regis North Quay Brisbane provides quality dining 7 days a week for breakfast, lunch and dinner. 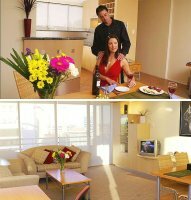 Enjoy a delightful meal overlooking the beautiful Brisbane river whilst staying at our luxurious Brisbane accommodation. The Park Regis North Quay Brisbane apartments are ideal for both business and leisure travellers. The apartments have been recently refurbished and are stylish, spacious and modern. All of the Park Regis apartments feature a full kitchen, king or 2 single beds, separate living area, sofa bed, DVD player, stereo, daily servicing and internet data port. When you are after luxurious Brisbane accommodation, be it for business or leisure, stay at the Park Regis North Quay Brisbane. The iStay River City Brisbane offers luxury Brisbane apartments that are perfect for the discerning business traveller or holiday guest. Overlooking the Brisbane River, the Botanical gardens and the CBD, the iStay River City Apartments introduces a whole new level of style, convenience and class when it comes to Brisbane CBD accommodation. Guests staying at the iStay River City will have easy access to bars, restaurants, cafes, shops, entertainment, sporting and conference venues. The iStay River City provides a selection of one and two bedroom fully self contained apartments that boast large panoramic windows and balconies which take advantage of the location with stunning views out over the river and city. 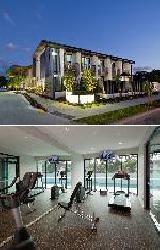 Resort style facilities complete the picture at this luxury Brisbane accommodation with a gym, hydro spa, swimming pool, BBQ area, luggage storage, undercover secure car parking and tour desk. The Bridgewater Terraces offers the self catering executive or traveller and holiday maker, island-like tranquility just a few minutes ferry ride from the centre of city of Brisbane. The rooms range from quality 2 bedroom apartments to spacious 3 bedroom serviced apartments that are ideal for large families and relocations. 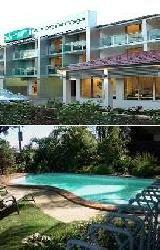 Ideally positioned in a delightful riverside location the Bridgewater Terrace Apartments is a low rise riverside resort style accommodation in Brisbane that is surrounded by lush gardens and a sparkling stream which meanders towards the swimming pool and barbecue area. 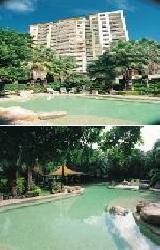 The Bridgewater Terrace Apartments truly is a tranquil oasis in the heart of the Brisbane CBD. The Econo Lodge City Star offers motel rooms that are conveniently located at Kangaroo Point only 2 km from Brisbane city centre. This discount Kangaroo Point accommodation consists of single, double, twin share, triple and two bedroom family hotel suites that are all spotlessly clean and comfortable. 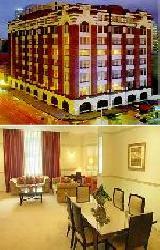 These fully refurbished and contemporary styled hotel rooms are serviced daily and provide exceptional value for money. 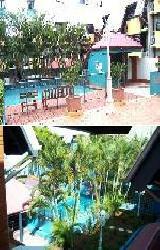 The City Star Motor Inn also has a fenced outdoor swimming pool in a tropical setting with BBQ facilities, deck and outdoor courtyard. The Econo Lodge City Star is located close to the CBD, opposite a large park with picnic facilities and recreational playground. This Brisbane accommodation is only a few minutes walk to the Gabba, Southbank TAFE, Shaftson University and the Story Bridge Climb. Mount Olivet Hospital, Princess Alexandra Hospital, Mater Hospital and Greenslopes Private Hospital are also just a short drive away from the City Star Motel Brisbane. Ideally located in the heart of Brisbane's northern suburbs, The Chermside Apartments provides luxury fully self-contained apartment suites for both short and long term accommodation in Brisbane. With the Westfield Shopping Centre right next door the Chermside Apartments has everything that you will need just a short walk away. When you stay at this Brisbane property you can choose from either a studio suite or a fully self-contained 2 or 3 bedroom apartment. 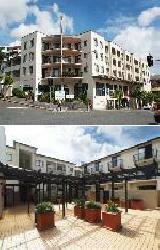 Each of these apartments has a range of great features and facilities including top latex mattress, leather lounge, spacious balcony, reverse cycle air-conditioning, LCD TV with Foxtel, full kitchen and laundry facilities, fast broadband internet connection, intercom security and safe deposit boxes. At the Chermside Apartments Brisbane there is also a daily housekeeping service, business services, heated swimming pool and sundeck, sSecure building access and free undercover security car parking. 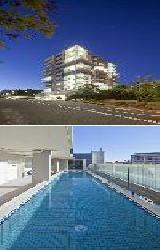 Apartment accommodation in Brisbane's North does not get any better than the Chermside Apartments. The Sebel South Brisbane has a wide range of luxury studio & 1 bedroom serviced apartments available for guests to choose from. They are ideally positioned only steps away from the Mater Hospital and within easy walk to the trendy cafes, pubs and the West End dining precinct. The The Sebel South Brisbane Apartments is ideal for leisure and business travellers alike becuase it is located in the heart of South Brisbane, just moments from the Brisbane Convention Centre, QPAC, GOMA, the Gabba, South Bank and everything that the city has to offer. The property also has numerous guest facilities and services including fitness equipment, lift, outdoor swimming pool, tour desk, bbq facilities and baby cots available for families to use. The Sebel South Brisbane caters for business travellers with high speed internet in all studios, apartments and throughout the hotel, faxing facilities, photocopying services, boardroom and meeting facilities. Swim in Annerley Hotel Motel's sparkling blue pool, cook a tasty Aussie BBQ, or just sit and relax on the wide balconies attached to your motel style unit and enjoy the glorious mountain and Brisbane's skyline views from your fully refurbished room located only 6km from the Brisbane CBD. The Annerley Hotel Brisbane offers 3 ½ star rooms in Brisbane which consists of fully refurbished units or apartments that complement Brisbane's tropical atmosphere. 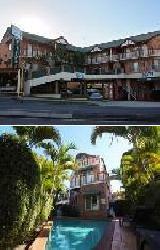 Annerley Motor Inn is located only 6km from Brisbane CBD and is amongst the best 3.5 star motel style accommodation found in Brisbane. Brisbane offers something for everyone. You can explore Brisbane's art scene, local landmarks, beautiful parks and much more. The Mantra on Edward St Brisbane Serviced Apartments offers 1, 2 & 3 bedroom self contained furnished apartments in the heart of the Brisbane CBD, ideal for holiday makers or business corporate travellers looking for either short or long term accommodation in a great Brisbane location. The Mantra on Edward St Brisbane in Brisbane CBD is close to everything that the city has to offer, as well as having a numerous guests facilities and services including gym & fitness equipment, lift, spa, outdoor swimming pool, tour desk and 24 hour reception. You’ll never be at a loss for things to do with the friendly staff at the Mantra on Edward tour desk there to help you with your every request. The Bridgewater Apartments have the highest standards for your comfort creating the ideal place for the corporate and leisure traveller. They are positioned on the banks of the Brisbane River at Kangaroo Point and only minutes from the heart of Brisbane CBD. The Bridgewater Apartments offer superbly appointed studio, one, two and three bedroom apartments featuring spectacular city and river views. Providing the perfect setting and easy access to to the CBD and South Bank via the river ferry or taxi, Bridgewater Apartments has it all. There is even a landscaped garden, lagoon swimming pool, barbeque area, gym, spa and sauna at this quality Kangaroo Point accommodation. Mt Ommaney Apartment Hotel is positioned only 15 minutes from the city centre and is centrally located to the commercial and business districts of Wacol, Ipswich, Darra, Carole Park, Richlands, Oxley, Rocklea and Jindalee. Mt Ommaney Hotel Apartments offers comfortable hotel style rooms and 1 bedroom apartments combined with dedicated customer service and attention to detail. The Mt Ommaney Hotel Apartments also provides a wide range of facilities including families, car parking, conference facilities, landscaped gardens, full size tennis court, BBQ facilities swimming pool and spa. 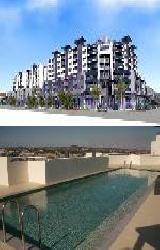 Parks and & bike tracks are close by and a major shopping centre is directly opposite. The Somersets Restaurant at this Mt Ommaney accommodation is a fully licensed a la carte restaurant offering contemporary Australian cuisine in a relaxed atmosphere. Guests staying in this ideal Brisbane accommodation located in the centre of the city will have easy access to all of the sights and experiences that the city has to offer. The Metro Tower Mill Hotel features hotel rooms that have their own private balcony and a variety of in-room features such as complimentary movies, foxtel and air conditioning to make sure that you feel right at home. This Brisbane accommodation is one of the most popular in the heart of the city centre. The Metro Tower Mill Hotel also has ground floor conference and seminar facilities, a fully licensed ground floor restaurant and bar open 7 days for breakfast and Monday to Saturday for lunch and dinner. 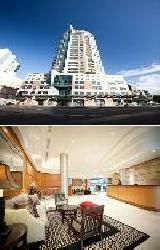 The Astor Serviced Apartments are ideally located in the heart of the Brisbane CBD. Being only a short stroll from the CBD shopping at David Jones, Myer and numerous specialty shops, restaurants and cafes makes this Brisbane accommodation so appealing. When you stay in the generously sized, fully self-contained apartments at the Astor in Brisbane you will also be able to visit Brisbane's Treasury Casino, Brisbane Convention Centre, Suncorp Stadium, Roma Street parklands, Brisbane River walkway and the Botanical Gardens which are also located close by. The Astor Apartments Brisbane will make sure that your accommodation in Brisbane for either business or pleasure is an enjoyable experience. The Brisbanes Best Indooroopilly provides people travelling to Brisbane with a selection of spacious two and three bedroom two bathroom fully furnished and self-contained Queenslander style serviced townhouses which are ideal for short or long term accommodation for families relocating, holiday makers and business corporate travelers alike. The Brisbanes Best Indooroopilly Apartments in Indooroopilly is close to everything that the city has to offer, as well as having a numerous guests facilities and services including faxing facilities, free car parking, fitness equipment, outdoor swimming pool, bbq facilities, a landscaped garden and security access. The Brisbane Eastwood Apartments provides travellers with a selection of studio, 1 & 2 bedroom self contained serviced apartments centrally in Woolloongabba, ideal for holidaymakers or corporate business travellers looking for either short or long term accommodation in a great Brisbane location. The Eastwood Apartments in Woolloongabba is close to everything that the city has to offer, as well as having a numerous guests facilities and services including faxing facilities, free car parking, lift, spa, outdoor swimming pool, bbq, baby cots available, daily housekeeping, Free WiFi internet access, dry cleaning service, wake-up service non-smoking throughout and a designated smoking area. Brisbane's Hotel Urban is a unique concept city propert that has been recently refurbished, producing an impressive, architecturally designed, luxury hotel complete with designer furnishes and fittings throughout. All of these Brisbane acoomodation rooms have a private walk-out balcony with superb vistas of the Roma Street Parklands or Brisbane city skyline. Whether you are staying for business or leisure all of the guest hotel rooms have been individually designed with your relaxation in mind, fromt the reverse cycle air-conditioning through to the comfiest beds ever. The recreational amenities at the Hotel Urban Brisbane include a gorgeous 10m outdoor swimming pool, a fitness facility, secure undercover car parking and a Gazebo bar and restaurant complete with stylish outdoor area. If you are looking for the convenience of being right in the heart of the city and on the doorstep of some of the best shopping and finest restaurants in Brisbane then Spring Hill Mews is the place for you. Positioned in a secluded hideaway away from the busy main roads this luxury Spring Hill accommodation are is a Mediterranean style "Oasis in The City". Featuring a tranquil garden setting, outdoor swimming pool, security, BBQ area and free secure car parking the Spring Hill Mews Apartments is perfect for short or long term stays. There is a range of 1 & 2 bedroom self-contained serviced apartments at Spring Hill Mews, all of which are air conditioned and stylishly furnished. Spring Hill Mews is located only five minutes walk to train stations, 2km to the golf course and very close to hospitals and other public facilities. The Quattro on Astor Brisbane Apartments is a boutique apartment complex in the heart of Spring Hill offering quality contemporary 2 bedroom 2 bathroom self contained apartments & penthouses that are full of luxury amenities. Quattro on Astor Apartments are centrally located just a 5-minute stroll to the Brisbane CBD and in close proximity to the best cafes and restaurants the city has to offer. The Quattro on Astor Apartments is close to everything that the city has to offer, as well as having a numerous guests facilities and services including direct internet access, faxing facilities, lift, massage, room service, sauna, spa, outdoor swimming pool, garden, airport shuttle, security, baby cots available and a babysitting service. The Quattro on Astor Apartment Accommodation is ideal for holidaymakers and corporate business guests for either a short or long term stay. Ideally positioned in the heart of Fortitude Valley the FV4006 Apartments provides boutique 2 bedroom self contained apartment accommodation in one of Brisbane's most vibrant and exciting inner city locations. Being situated just 1km from the Brisbane CBD, the FV4006 Brisbane Apartments are within quick and easy access of everything that the city has to offer. The FV4006 Apartments in Fortitude Valley is close to everything that the city has to offer, as well as having a numerous guests facilities and services including free car parking, lift and outdoor swimming pool. With stylish design, cosmopolitan ambience and great amenities the FV4006 Apartments provides the best of Queensland living in a great Brisbane location. South Central Exceutive Apartments in Brisbane offers guests the choice of 1 & 2 bedroom serviced apartments located in Southbank, which is only 1km from the Brisbane CBD and the heart of South Brisbane. These modern apartments have been designed to live, work and play in South Brisbane, which is fast becoming a cultural pulse in this thriving city. The South Central Apartments in South Brisbane are close to everything that the city has to offer, as well as having a many guests facilities and services including free car parking, lift, outdoor swimming pool, bbq, security and baby cots available. With public transport and cycling tracks at the doorstep guests are not far away from numerous restaurants, cafes, shopping and entertainment spots. West End Central offers modern studio, 1 & 2 bedroom apartments which are stylish and fashionable, offering comfort and excellent value. This apartment hotel is ideally located within walking distance to the Brisbane CBD, between the cosmopolitan West End and Brisbanes cultural, recreational and entertainment hub of South Bank, and a short stroll to the Convention and Exhibition Centre and Performance Art Centre. The Central Westend Apartments combines luxury with relaxation and is located in an intimate, village atmosphere surrounded by vibrant restaurants, cafes and bars with numerous entertainment options and shopping just minutes away. Just moments from the Southbank parklands and Brisbane's best theatres, Central West End offers major public transport stops just moments from your door, with Brisbane airport only twenty kilometres away. The Central Westend has a range of guest facilities including an outdoor swimming pool, sauna and spa, fully equipped gymnasium, barbeque facilities and sundeck, laundry service, tour desk, security cameras, charge back facilities with local restaurants, daily housekeeping, lift, business services and free secure undercover parking. Both business and leisure travellers will find that the Punt Hill Brisbane Apartments provides a great place to stay in Spring Hill, with stylish and spacious studio apartment accommodation that is conveniently located only a few minutes walk to the heart of Brisbane CBD. All of the guest accomodation rooms at the Punt Hill Brisbane feature luxurious king beds, a private balcony, kitchen, workspace, flat screen TV, iPod dock and a quirky, contemporary designer furnishings. 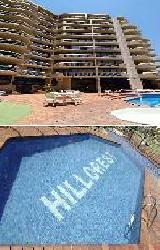 The Punt Hill Brisbane provides all types of travellers with discount accommodation in Spring Hill. It also features a wide range of modern amenities and services such as guest laundry, lift and baby cots available for families travelling to Brisbane. 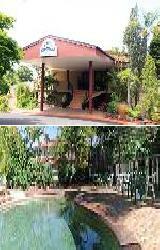 This Brisbane hotel / motel offers four star luxury accommodation in Brisbane, Boondall. 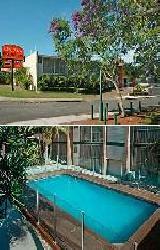 The Palms Motel Hotel Brisbane is conveniently located close to the Brisbane airport, Brisbane Boondall Entertainment Centre, Brisbane Northern Industrial Zones, Eagle Farm, Virginia, Strathpine, Virginia Golf Club and is only 20 mins from the Brisbane CBD. 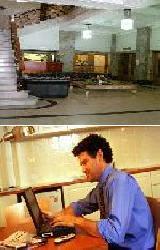 Great value Brisbane hotel rooms for both corporate or leisure guests. The Royal Albert Apartment Hotel Brisbane offers heritage accommodation in the heart of the Brisbane CBD which will suit both business and leisure travellers alike. Because it is located in the heart of the Brisbane city centre the Royal Albert Boutique Apartment Hotel is a fantastic place to stay. Warm, personable service combine with luxury features to make the Royal Albert Boutique Hotel one of the best Brisbane hotels available. Stiuated close by are Brisbane's Queen St mall, Myer centre, Treasury Casino, theatres, shopping centres and Albert St's restaurant precinct. To escape the city, the Botanic Gardens and riverside walk to South Bank Parklands are also located close by to this Brisbane accommodation. Guest services at the Royal Albert Apartment Hotel include licensed restaurants, dry cleaning service, free daily newspaper, 24 hour reception, room service, tour desk, valet car parking, bar, business center, airport shuttle and daily housekeeping. The Aabon Holiday Apartments offer budget Brisbane accommodation in Wooloowin, close to the CBD, the entertainment centre at Boondall and major city hospitals. Situated just off the highway in the leafy, inner city suburb of Wooloowin the Aabon Holiday Apartments combines outstanding service and great hotel facilities with the spaciousness and convenience of self-contained apartments. Whether you are attending the Ekka show, theatre, concert or just doing business in the city, the studio, 1 and 2 bedroom apartments Aabon is the place for you. The facilities it this Wooloowin accommodation include an outdoor swimming pool, spa and BBQ area, free broadband internet access, free on-site car parking, guest laundry and tour desk. Being ideally located close to the Brisbane CBD, guests are just a short journey from everything that they need including shopping, bars, cafes, restaurants, parklands and universities. 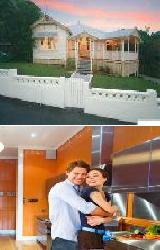 Chasely Apartments offers 1 & 2 bedroom self contained serviced apartments at the best riverside address in Brisbane. Overlooking the Brisbane River the Chasely Apartments is the most affordable home away from home, ideally located in Brisbane next door to the renowned Wesley Hospital, close to Suncorp Football Stadium, nearby trendy restaurants on Park Road, with Brisbane CDB and Southbank only a short bus or ferry ride away. The Chasely Apartments in Auchenflower is close to everything that the city has to offer, as well as having a numerous guests facilities and services including business centre, conference centre, direct internet access, faxing facilities, free car parking, lift, tour desk, airport shuttle and baby cots. 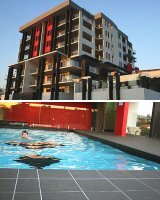 The Chasely Apartments Brisbane offer affordable apartment accommodation in an excellent Brisbane location, ideal for leisure and business. The Wellington Apartment Hotel is ideally located for you to take advantage of the excellent shopping, dining and nightlife of the Brisbane city centre. It provides luxury, newly refurbished hotel and studio apartments in the trendy suburb of Kangaroo Point, which is close to the CBD. Guest who stay at the Wellington Apartment Hotel will really appreciate the convenient location, friendly service and stunning city views from this relaxing inner city hotel. The Wellington Apartment Hotel is just a few minutes by car from the Brisbane city centre, a short stroll to catch the City Cat ferry or public transport and minutes from the famous Gabba Cricket Ground. With a range of stylish guest rooms and spacious self-contained studio apartments over three levels the Wellington Apartment Hotel is perfect for your next stay in Brisbane. All guest accommodation rooms and apartments are spacious, beautifully appointed and non smoking for added guest convenience. The Gabba Central by Vivo Apartments, Brisbane offers quality apartment accommodation in Woolloongabba for holidaymakers, corporate clients and sporting enthusiasts. With a range of Queen hotel rooms, King/Twin Studios and 1 & 2 Bedroom family apartments, the Gabba Central by Vivo is the perfect home away from home. These Brisbane Apartments are situated directly opposite the iconic Gabba Cricket Ground and only 5 minutes away from the famous Southbank Parklands, Queensland Performing Arts Centre, Queensland Museum, State Library, Brisbane Convention Centre and Brisbane Exhibition & Convention Centre. Also the Brisbane CBD with its hundreds of quality shops, eateries, fine dining, bars and nightclubs is just 10 minutes away. With such great cultural venues and exhibition venues nearby, the Gabba Central by Vivo Apartments is the perfect location for your next stay in Brisbane. The Gabba Central offers an excellent range of facilities and service, including an outdoor swimming pool, sauna and steam room, gym, BBQ facilities, free secure undercover car parking, guest laundry, tour desk and Broadband internet access in all apartments. The Bonapartes Serviced Apartments in Brisbane offers all types of travellers the choice of 1 & 2 bedroom self contained serviced apartments that are centrally located on the edge of the Brisbane city and Fortitude Valley. They are also close to historic Spring Hill, cafes, restaurants, galleries, shops, Brisbane Chinatown, RNA Showgrounds Suncorp Stadium, Ballymore, the Gabba and Brisbane's major hospitals. 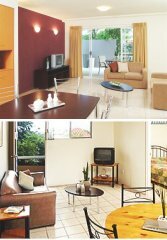 Bonapartes Serviced Apartments provides 2 levels of quality accommodation with a choice of 1 or 2 bedroom apartments. It also provides guest facilities including a swimming pool, a well equipped gymnasium, BBQ facilities and entertaining area, a central garden courtyard, cafe and restaurant, bar, internet kiosk, secure off-street car parking, wireless Broadband internet and tour desk. 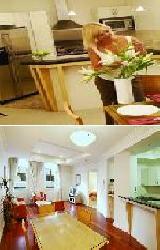 Bonapartes Serviced Apartments offers all the comforts of home in a fantastic Brisbane city location. The Inn on the Park is ideally situated only 3 kms to the Brisbane CBD and provides guests with a wide range of 1 & 2 bedroom self contained serviced apartments opposite the Brisbane River. The Inn on the Park Brisbane Apartments are located close to all public transport options including the river cat, bus and train, as well as being close to shops including the Toowong Tower, Toowong Shopping Village and the trendy Park Road precinct with cafes, restaurants and specialty shops. 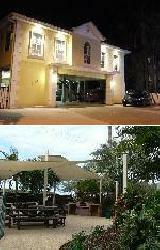 The Inn on the Park in Toowong is close to everything that the city has to offer, as well as having a numerous guests facilities and services including direct internet access, free car parking, guest laundry, lift, outdoor swimming pool, well equipped gym, common room, cot hire and games room. The City Park Apartments provides accommodation that is perfect for business or leisure guests with a variety of studio, 1 & 2 bedroom self contained serviced apartments. The Brisbane City Park Apartments are the ideal central base from which to experience the best Brisbane has to offer because they are positioned in Spring Hill close to everything that the city has to offer. The City Park Apartments also has numerous guests facilities and services including free car parking, lift, outdoor swimming pool, tour desk and security access for your convenience. The property is located within an easy walk to the Brisbane city and cosmopolitan Fortitude Valley and with public transport at front door as well as the free Spring Hill Loop bus stop just around the corner. 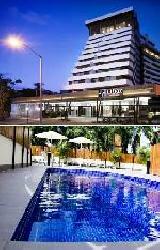 The Buranda Lodge has on offer a variety of different hotel accommodation rooms for the budget conscious travellers. Ideallt located in Woolloongabba only a 4 minute drive from the Brisbane CBD, directly across from the Princess Alexandra Hospital and within easy walking distance to its many specialist services, the Buranda Lodge is within an easy walk of the local shopping centre and the Busway and Train stations. 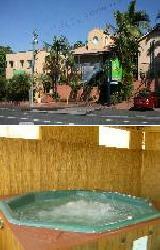 The Buranda Lodge provides all types of travellers with discount accommodation in Woolloongabba. It also features a wide range of modern amenities and services such as direct internet access, faxing facilities, free car parking, guest laundry, security access, late check-out, non-smoking rooms, luggage storage, baby cots available and daily housekeeping. 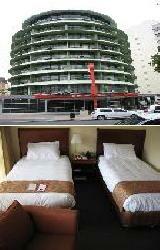 The Metropolitan Motor Inn provides travellers with relaxed executive Brisbane accommodation in the city. The Metropolitan Motor Inn is superbly located within close proximity to the city centre, central train station, Roma Street parklands, Suncorp Stadium, Ballymore, RNA Showgrounds, aquatic centre, Brisbane cultural centre, botanic gardens and southbank parklands. The warm and friendly customer service combine with the spacious quiet hotel rooms to make The Metropolitan Motor Inn a perfect place to stay. Superbly positioned in inner city Spring Hill only two blocks from the Central Business District this Brisbane accommodation has all of the conveniences that you would expect from an executive hotel. The facilities include free car parking, 24 hour reception, restaurant, lift, conference rooms, business centre, room service, wireless broadband internet, bar, free Foxtel, guest laundry and Wifi access. The Essence Apartments has a wide selection of stylish and modern studio apartments as well as 1 & 2 bedroom self contained apartments. The property is ideally located in the heart of Chermside, close to the Prince Charles and Holy Spirit Hospitals, cultural locations, public transport and the Brisbane Airport. The Essence Apartments in Chermside has numerous guests facilities and services including business centre, conference centre, direct internet access, disabled facilities, faxing facilities, free car parking, lift, bbq and baby cots available. 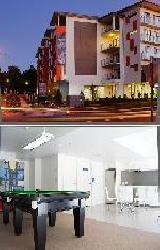 The Essence Apartments in Chermside, Brisbane is a great place to stay for both corporate and leisure travellers. The Windsor International Motel combines four star hospitality, Australian history and modern Queensland architecture to provide guests with a unique accommodation experience. 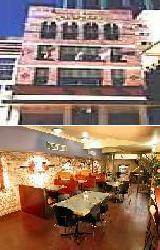 The famous Va Bene Italian Ristorante is situated within the Windsor International. Our chef, Michele Loffredo with his authentic style, fine artistry and talents has touched the hearts and palates of many. Situated in Windsor just north of Brisbane's central business district, with easy access to the city by bus, train or taxi, the Motel is conveniently located near the Royal Brisbane Hospital, Brisbane Exhibition Ground and the sporting venues of Ballymore Football Field and Downey Park. 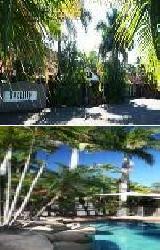 The Minto Guest House is a cheap and affordable Brisbane accommodation that is guaranteed not to break the budget. Minto is a delight to the senses where guests can live in the colonial charm of yesteryear, feel the breezes on the veranda or relax by the fire in the common room. This budget Brisbane accommodation exudes a special ambiance and is committed to providing clean, comfortable guest house style rooms that make you feel right at home. Other features at Minto include a fully equipped huge Chef's kitchen & free wireless internet access. A stay in this Brisbane property will ensure a quiet and harmonious stay whilst still allowing you plenty of money to spend on shopping or eating out at the nearby restaurants. The Oasis Apartments in Brisbane is a dual highrise complex offering serviced 1, 2 and 3 bedroom self contained apartments which are perfect for long term, short term and corporate business guests. Situated in Auchenflower just 2.5kms from the Brisbane CBD, the Oasis Apartments is ideally positioned on the Brisbane river, across the road from the Wesley Hospital and close to all of the corporate offices along Coronation Drive and the surrounding Milton and Indooroopilly areas. 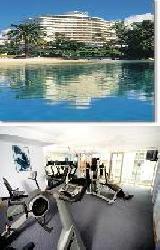 The Oasis Apartments in Auchenflower offers guests fabulous resort recreation facilities including a 20 meter resort style pool, spa, lush tropical landscaping, full sized tennis court, sauna and steam room, fully equipped gymnasium, barbeque facilities and entertaining area. 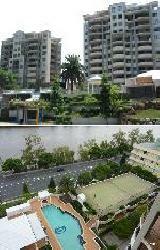 Neighboring suburbs that are close to the Oasis Apartments Brisbane include Toowong, Milton and Indooropilly. The Oasis Apartments is also close to excellent public transport facilities with the train station just 5 minutes walk away, a bus stop right outside the front and just down the road is the City Cat Ferry terminal. The City Palms Motel gives leisure or corporate business travellers a choice of budget hotel accommodation that is centrally located in Fortitude Valley. Suited to either short or long term accommodation, The City Palms Motel Brisbane is conveniently situated in the heart of Fortitude Valley, only minutes from the great shopping and night-life of the Brisbane CBD, Cosmopolitan Valley, China Town, RNA Show-grounds and the Royal Brisbane Hospital. The City Palms Motel in Fortitude Valley is close to everything that the city has to offer, as well as having a numerous guests facilities and services including free car parking, spa, bbq facilities, garden, security access for your safety and daily housekeeping. At the The City Palms Motel there are also business facilities including FREE Wifi internet access, faxing facilities and photocopying services. Located directly across from the beautiful Scarborough Beach on the northern boundary of Redcliffe Peninsula the Scarborough Beach Resort offers luxury studio, 1, 2 & 3 bedroom self contained serviced apartments that are a great place to unwind. Scarborough Beach Resort is surrounded by an array of restaurants and coffee shops and is situated only 35 minutes from Brisbane Airport and 50 minutes drive from the Brisbane CBD. 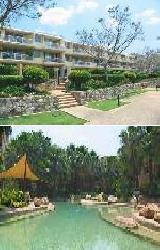 The Scarborough Beach Resort in Redcliffe Peninsula is close to everything that the city has to offer, as well as having a numerous guests facilities and services including conference facilities, disabled facilities, fitness equipment, lift, sauna, spa, outdoor swimming pool and bbq facilities for guest use. Further business services include faxing facilities and photocopying services. With great accommodation and facilities, you are sure to have memorable and relaxing experience at the Scarborough Beach Resort. The Glen Hotel & Suites provides travellers with quality hotel accommodation in Eight Mile Plains, close to the Brisbane Technology Park, Westfield Garden City Shopping Centre and only 15 kilometres from the Brisbane CBD. As a leisure & business accommodation the Glen Hotel & Suites is second to none with luxury accommodation to compliment the already famous Glen Hotel. 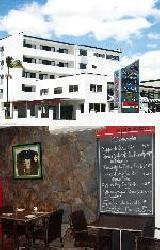 The Glen Hotel and Suites provides all types of travellers with discount accommodation in Eight Mile Plains. It also features a wide range of modern amenities and services such as lounge bar, conference facilities, faxing facilities, free car parking, guest laundry, fitness equipment, lift, restaurant, room service, outdoor swimming pool, tour desk, airport shuttle, 24 hour reception, babysitting service, daily housekeeping, free cot hire, laundry service, free wifi throughout, free wifi in all public areas, luggage storage, interconnecting rooms, photocopying services, safety deposit box and much more. 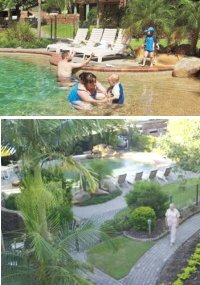 The Springfield Lakes Hotel provides all types of business, leisure, group and family travellers with discount accommodation in the Brisbane suburb of Springfield. This quality hotel accommodation property also features a wide range of modern amenities and services such as lounge bar, business centre, conference facilities, direct internet access, disabled facilities, free car parking, guest laundry, gym & fitness equipment, lift, restaurant, outdoor swimming pool, tour desk, laundry service, non smoking rooms, free wifi throughout, luggage storage, safety deposit box and facilities for disabled guests. The Springfield Lakes Hotel offers business and leisure travellers to Brisbane, Ipswich and the surrounding areas the ideal place to stay at an affordable price that won't break the budget. The Johnson Road Motel in Brisbane provides ultra modern hotel accommodation in Hillcrest, just 2 minutes from Browns Plains in Logan City. Ideal for the discerning business, corporate or leisure traveller, the Johnson Road Motel, Brisbane is located within 32 kilometres from the Brisbane CBD and just a short drive to the industrial areas of Browns Plains, Crestmead, Wacol and the new Southlink Business Park. The Johnson Road Motel in Hillcrest is close to everything that the city has to offer, as well as having a numerous guests facilities and services including lounge bar, business centre, conference centre, direct internet access, disabled facilities, faxing facilities, free car parking, guest laundry, fitness equipment, restaurant, room service, bbq facilities, landscaped garden, security, baby cots available and daily housekeeping. The Johnson Road Motel is the perfect choice for your Hillcrest accommodation needs. The Chermside Court Motel has a range of budget motel accommodation that is ideally located in the suburb of Chermside, which is in the heart of North Brisbane. Situated well away from the traffic noise and bustle of busy Gympie Road, The Chermside Court Motel is located in a leafy green quiet Chermside residential area, close to Prince Charles Hospital and Holy Spirit Northside Private Hospitals, just 850 metres from the popular Westfield Chermside Shopping Centre. 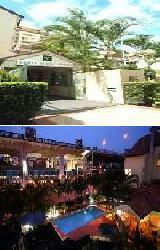 The Chermside Court Motel provides all types of travellers with discount accommodation in Chermside. It also features a wide range of modern amenities and services such as direct internet access, disabled facilities, faxing facilities, free car parking, guest laundry, baby cots available and daily housekeeping. The Chermside Court Motel offers personal service with each guest treated as an individual and every effort made to cater for guests special needs. The Quality Inn Airport Heritage Hotel & Apartments provides boutique hotel rooms & 2 bedroom self contained serviced apartments, just 7 minutes drive to Brisbane airport and the Brisbane CBD. With exceptional standards and cheap rates the Quality Inn Airport Heritage Hotel and Apartments provides all types of travellers with great accommodation in Hamilton, Brisbane. This property also features a wide range of modern amenities such as business centre, conference centre, direct internet access, faxing facilities, free car parking, guest laundry, lift, restaurant, room service, outdoor swimming pool, tour desk, baby cots available and daily housekeeping. Whether you are a corporate traveller, international visitor, family or leisure guest looking for great accommodation in a central location the Airport Heritage Hotel and Apartments is the place for you. The Airport Hacienda Motel is ideally positioned in Hamilton and offers motel accommodation close to the Brisbane Airport. 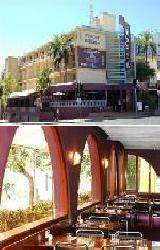 The Airport Hacienda Motel offers comfortable accommodation in Brisbane at an affordable price. It is situated only 10 minutes from the Brisbane Airport with easy access to the Portside Cruise Terminal, shops, cinemas, city ferry, the Sunshine and Gold Coasts as well as local attractions including the Boondall Entertainment Complex and much more. The Airport Hacienda Motel in Brisbane Airport is close to everything that the city has to offer, as well as having a numerous guests facilities and services. 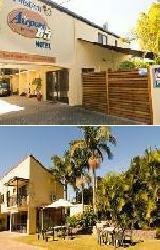 The friendly, helpful staff at the Airport Hacienda Motel are ready to ensure a fun-filled memorable stay in Brisbane. Brisbane Street Studios offers self contained studio apartments centrally located in the inner city suburb of Annerley, whcih is only 50 metres to the entrance of the Princess Alexandra Hospital. 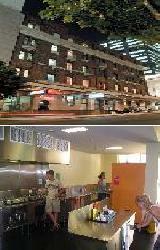 City buses stop out front and Dutton Park train station is just a short walk from this budget Brisbane accommodation. The Brisbane Street Studios provides all types of travellers with discount accommodation in Annerley and also features a wide range of modern amenities such as direct internet access, faxing facilities, free car parking, guest laundry, lift, tour desk, bbq and baby cots available. Brisbane Street Studios caters for corporate travellers with FREE Broadband Internet connection in all studios. 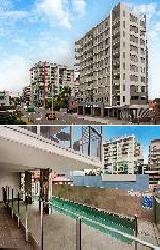 The Brisbane Street Studios Serviiced Apartments offerr excellent value for money in a fantastic Brisbane location. The Miro Apartments are a great place to stay providing a unique apartments in Fortitude Valley, the heart of Brisbane's artistic precinct. 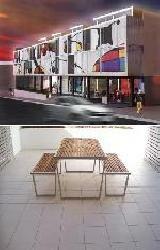 Culture, sophistication and artistic style is what makes The Miro different from other Brisbane accommodation. The Miro provides 1 & 2 bedroom self contained apartments that are fully self contained and feature fully equipped kitchens and laundries, spacious lounge room, LCD Plasma TVs, broadband internet and courtyard/balcony. 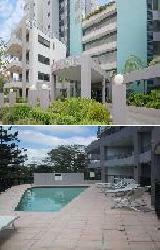 This sylish Brisbane property is in an ideal location for the upmarket executive business person or discerning leisure traveller wanting an apartment with class. 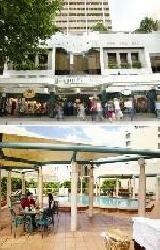 Close by to the Miro Apartments is China Town, the Royal Brisbane Hospital and Royal Brisbane Show grounds. The Diana Plaza Hotel Brisbane provides excellent value for money Brisbane accommodation in a superb city location close to the Southbank Parklands, Brisbane Convention and Exhibition Centre, the Gabba and the city centre. The Diana Plaza Hotel features quality hotel rooms, restaurant, cocktail bar, coffee lounge and the Apollo's Health & Fitness Centre including a fully equipped gymnasium, spa, sauna and a traditional Asian Bath House. This Brisbane hotel also boasts free car parking, 24 hour reception & room service, high speed wireless internet, tour desk, guest laundry and business centre. The Diana Plaza Hotel features a range of deluxe rooms and suites all with modern and comfortable furnishings and fittings. Whether on business or holiday all guest rooms and suites are designed to help guests relax in comfort and style. The Airport Clayfield Motel provides business and holiday travellers with a choice of budget motel room that are a great place to stay with you are flying in and out of Brisbane, because this discount accommodation is ideally situated only 10 minutes drive from the Brisbane Airport. The Airport Clayfield Motel is also close by to the Brisbane CBD, Doomben and Eagle Farm racetracks, Boondall Entertainment Centre, Suncorp Stadium, Brisbane Entertainment Centre and Portside Wharf. The Airport Clayfield Motel in Brisbane Airport is close to everything that the city has to offer, as well as having a numerous guests facilities and services including direct internet access, luggage storage, interconnecting rooms, free car parking, guest laundry, lift, room service, tour desk, bbq, free car parking and daily housekeeping. The Airport Clayfield Motel also caters to corporate business travellers with free WIFI internet access in all hotel rooms, faxing facilities and photocopying services. 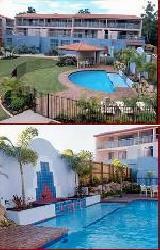 The Brisbane Airport Inn offers comfortable and affordable holiday rooms to suit all needs and budgets. Located opposite the Brisbane port harbour of Hamilton and only a short stroll to the City Cat ferry and city bus stop the Brisbane Airport Inn Hotel provides convenient access to both the CBD and Brisbane Airports. This quality hotel is also surrounded by a variety of restaurants, cafes and boutique shopping, library, pubs and all major banks. The Brisbane Airport Inn is close to everything that the city has to offer, as well as having a numerous guests facilities and services including direct internet access, free car parking, guest laundry, bbq and baby cots. Corporate business clients are well catered for with FREE Wifi in all guest rooms and apartments, faxing facilities, printing services and photocopying facilities. Enjoy a spectacular park view and Brisbane city fringe convenience at a very affordable price at the Airport Inn Brisbane. 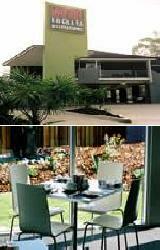 This Brisbane hotel / motel offers four star luxury accommodation in Rocklea, Brisbane. This absolutely delightful hotel / motel is ideally located close to the Rocklea Market, Archerfield Airport and Speedway, Willowbank and Queensland Raceways, Southbank, the Gabba and the ANZ Stadium. Delicious restaurants are only a short walk away while the Brisbane CBD is a short 10 minute drive. 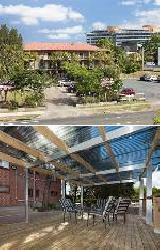 The Rocklea Brisbane is a purpose built hotel / motel offering the highest 4 star standard, including facilities such as direct internet connections in your room, disabled hotel rooms, conference and meeting rooms. The Best Western Airport 85 Motel offers hotel rooms that are just 10 minutes from Brisbane International and Domestic Airport. Guests who stay at this Ascot property get Free car parking and Free continental breakfast each morning. The Airport 85 Motel is conveniently located ten minutes from Boondall Entertainment Centre and two minutes walk from Doomben and Eagle Farm racecourses. 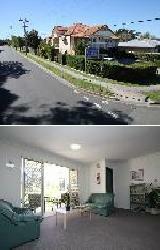 It also has public transport at the front door providing access to the Brisbane city centre. The Best Western Airport 85 Motel provides all types of travellers with discount accommodation in Ascot an also features a wide range of modern amenities such as direct internet access, free car parking, guest laundry, restaurant, outdoor swimming pool, tour desk, bbq, airport shuttle and daily housekeeping. The Royal on the Park Hotel Brisbane is a magnificent 4 ½ star accommodation hotel that offers unsurpassed luxury and an impeccable standard of personal service, in the very heart of Brisbane. Perfectly located, the recently refurbished Royal on the Park is a unique place to simply indulge, rest, or to do business. You'll find the look is elegant and contemporary, whilst the service is absolutely legendary. Guests can soak-up the spectacular views to the Botanic Gardens from the comfort of our well appointed guestrooms. And naturally, Reception and Room Service are at your call 24 hours a day. Car parking and Valet parking are available, and a daily newspaper is complimentary. In fact, when you're a guest at our hotel the personal attention is endless. The City Edge Brisbane Hotel is the ideal home away from home for travellers, providing friendly service with unbeatable discount rates in the heart of the Central Business District. The City Edge Brisbane Hotel specializes in cheap Brisbane accommodation that has been uniquely designed to suit the budget conscious traveller. The location is ideal, only a 3 minute walk to Treasury Casino, 150m to the Transit Centre, 150m to Queen Street Mall and close to the Southbank Parklands, Roma Street Parklands, Lang Park (Suncorp Stadium) and King George Square. Your stay in this Brisbane property will place you in the heart of everything Brisbane has to offer. An extensive range of services and facilities cater to the needs of the business and holiday traveller alike at the City Edge Brisbane Hotel. Situated inn the heart of Spring Hill, on the fringe of the Brisbane CBD, Spring Hill Central Apartments offers quality apartments that have been designed for both the holiday maker and busy corporate guest. Whether it's for long term or just over night, Spring Hill Central aims to provide you with quality rooms and service at competitive rates. All apartments have been designed to include all the necessities required for the busy corporate guest with fast dial access to all popular services. Spring Hill Central Apartments offers a choice of 1 & 2 bedroom fully furnished, self contained apartments accommodation that is non smoking and full of modern furniture and spacious living areas. Located minutes from Central Station and surrounded by resturaunts and cafes, a short taxi ride to Southbank and the Valley, Spring Hill Central is perfect for short term stays. Situated in the hub of Brisbane's corporate precinct, Spring Hill Central Apartments is very well suited to the corporate business guest or as a home away from home when relocating. The Southern Cross Motel & Serviced Apartments is ideally located in the Brisbane suburb of Kangaroo Point and provides travellers with a choice of modern motel accommodation as well as fully self contained 1 & 2 bedroom serviced apartments. With a positione close to the Brisbane CBD the Southern Cross Motel & Serviced Apartments Brisbane is ideal for leisure guests and business corporate travellers alike for either short or long term stays. It is conveniently situated within walking distance to the Gabba, which is the home of the Brisbane Lions AFL team and cricket in Queensland. The Southern Cross Motel and Serviced Apartments Brisbane features a wide range of modern amenities and services such as lounge bar, conference centre, direct internet access, disabled facilities, faxing facilities, free car parking, guest laundry, lift, restaurant, outdoor swimming pool, tour desk, bbq, 24 hour reception and daily housekeeping. 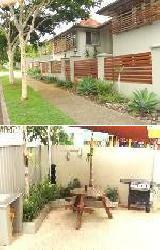 Enjoy the close proximity to the Brisbane CBD in quiet peaceful surrounds without the frantic pace of the city. 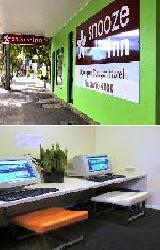 The Snooze Inn is a budget hotel that is ideally situated for visitors to Brisbane, right in the heart of Brisbane's most happening and cosmopolitan suburb, Fortitude Valley, only a few minutes walk from the Fortitude Valley train station and walking distance to all of the best bars, clubs, and nightlife of Brisbane. Ideal hotel rooms for business, vacation or an extended stay, the Snooze Inn is situated near some of Brisbane's famous landmarks including, the RNA Exhibtion centre (EKKA) showgrounds, Chinatown, the Tivoli, Royal Brisbane Hospitial and Suncorp Stadium. The Snooze Inn offers small inner city hotel rooms that are exceptionally clean, serviced daily for your comfort and great value for money. The hotel facilities at the Snooze Inn include a business centre, guest laundry and luggage storage. Located adjacent to the exciting Southbank precinct, Central Hillcrest Apartments offers hotel, 1, 2 & 3 bedroom self contained apartments with stunning views of the Brisbane River, South Bank Parklands and Brisbane city skyline out towards the Story Bridge and Brisbane Hinterland. 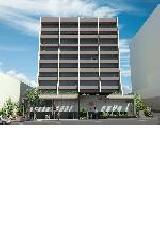 Central Hillcrest Apartments Hotel is just a short walk to the Brisbane CBD, major public transport, a range of restaurants, convenient to the theatre, cinemas, art gallery, museum, the famous GABBA cricket ground and Mater Hospital. Central Hillcrest Apartments offers clean, comfortable, affordable, budget hotel and apartments accommodation just moments from the heart of Brisbane. The Central Hillcrest Apartment Hotel also offers resort style facilities and services for guest enjoyment including a heated swimming pool, sauna, outdoor spa, full sized tennis court, games room, internet kiosk, restaurant, lounge bar and BBQ area. Brisbane is the perfect place to party, with its superb weather, bars, clubs and pubs, and the Base Backpackers Central hostel is located in the centre of all the action. Situated in a delightful heritage listed building in the very centre of the Brisbane city opposite Central Station, Base Brisbane Central provides everything you need at your fingertips. The Base Brisbane Central caters for both domestic and international travellers, offering clean, comfortable and secure rooms at fantastic budget prices. All dormitory accommodation at the Base Brisbane Central hostel is air conditioned and has a lockable cupboard, big enough to fit a backpack and a mirror and hooks for your clothing. Base Brisbane Central provides a restaurant, a bar/lounge, sunny rooftop BBQ area with deck lounges overlooking the city centre, a committed job agency with jobs all over Brisbane and beyond and a coffee shop/cafe with great value breakfast and dinner served until 9pm. Other amenities include barbecue grills, communal kitchen, large lounge area, wireless internet, cable TV, pool tables, safety deposit, tour desk, lift, faxing facilities, 24 hour security and 24 hour reception. Overlooking the Brisbane city and the stunning Roma Street Parklands, the newly refurbished The Summit Apartments are located at the top of the Brisbane CBD, walking distance to major public transport, restaurants, entertainment and shopping. The warm and friendly service, combined with the facilities, convenience and spaciousness of the fully self contained apartments, will ensure your stay at The Summit is beyond your expectations. Offering a choice of studio, 1 & 2 bedroom self contained non smoking apartments the The Summit Brisbane is an ideal base for a South East Queensland experience. 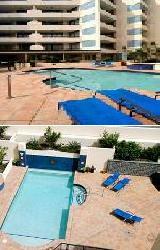 Guests can relax in the heated spa, sauna or outdoor swimmimg pool, compact tennis court, pool table and BBQ area. Enjoy the short stroll to the heart of Brisbane's Queen Street Mall where you can indulge in the many delights on offer including the vast array of restaurants along the picturesque Riverside Boardwalk, shopping, a day at beautiful Southbank, the Treasury Casino, Queensland Performing Arts Centre or a visit to the Museum. The Base Embassy Brisbane is a peaceful haven in the heart of the city, offering state of-the-art facilities and accommodation including spotlessly clean, air-conditioned and spacious rooms. The environment is calm and is linked to Base Central Backpackers, where guests can enjoy access to both facilities. 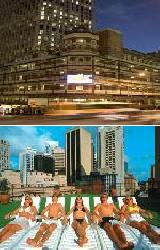 Base Brisbane Embassy is fantastically located in the heart of Brisbane CBD, backing onto the Queen Street Mall. Base Brisbane Embassy has been designed as a new generation hostel backpackers accommodation, being simple in nature yet offering somewhere comfortable to rest a weary head. Guests can also enjoy the amazing sundeck and FREE BBQ facilities with city views on the roof top, the spotlessly clean, large and modern self catering kitchen complete with cooking utensils and crockery and fridge. Conveniently located just minutes from the Brisbane airport, the Comfort Inn & Suites Northgate offers high quality budget hotel and apartments at affordable rates. With an airport shuttle bus and free car parking this Brisbane airport accommodation is ideal for travellers and corporate guests for short or long term stays. The range of hotel suites and fully self contained 2 bedroom family apartments provide unsurpassed budget accommodation, combined with friendly service to make you want to come back again and again. Offering all the services expected by today's discerning traveller, The Northgate Airport Hotel boasts fine dining at the exclusive Cafe Gateway, meeting facilities, business services, bar area, laundry service, outdoor swimming pool, room service, tour desk and wireless internet access. For apartments in Brisbane that seemlessly combines the old world style of a heritage building and the modern conveniences of technology stay at the Rothbury On Ann Apartment Hotel. It is one of the city's heritage treasures, built in 1931, providing timeless quality features and luxurious self-contained apartments. Rothbury On Ann is superbly located in the heart of the Brisbane CBD and only minutes walk from riverside dining, central railway station, Queen Street Mall, Myer Centre, cinemas, shopping, nightlife entertainment and the Casino. Also close by to this quality Brisbane property is all Government offices, medical specialists and corporate buildings, which make the Rothbury on Ann ideal for the corporate business traveller. Completely refurbished the Rothbury on Ann Heritage Apartment Hotel features modern facilities such as a roof top garden terrace, BBQ facilites, spa and sauna. 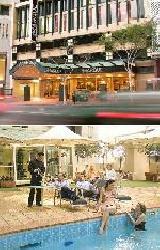 The Rendezvous Studio Hotel Brisbane on George (formerly the Marque Hotel Brisbane) is located in the heart of the Brisbane city, adjacent to the Treasury Casino and just a few minutes walk to the Brisbane River & Southbank Entertainment precinct. This discount Brisbane accommodation offers easy access to the best that Brisbane has to offer, allowing guests to explore some of the city's best attractions. With a selection of hotel rooms and suites the Rendezvous Studio Hotel Brisbane prides itself on it's clean, comfortable and cozy rooms. 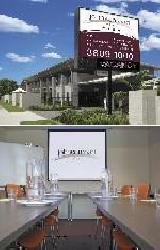 The Rendezvous Studio Hotel Brisbane also includes great onsite facilities including an outdoor swimming pool, exercise room, dry cleaning and laundry service, wireless internet access, business services, restaurant and cocktail bar. 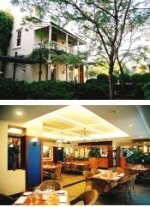 The Rendezvous Studio Hotel Brisbane on George provides friendly service in a relaxed atmosphere, making sure that your Brisbane accommodation is as comfortable as possible. The recently refurbished Rydges South Bank offers luxury Brisbane hotel rooms that are conveniently situated in the city's most enviable location, the arts and entertainment precinct in Southbank. Rydges South Bank adjoins with the Brisbane Convention & Exhibition Centre (BCEC) via a walkway and is only a short walk to the Queensland Performing Arts Centre (QPAC), Queensland Museum, State Library of Queensland and the new magnificent Gallery of Modern Art (GOMA). The city centre, Treasury Casino and Queen Street Mall are just a short 10-minute stroll away from this luxury Brisbane accommodation. The Rydges Southbank Hotel Brisbane is the perfect place to take advantage of Brisbane's outdoor lifestyle with the South Bank Parklands, South Bank's man-made beach and the weekend arts and craft markets nearby. 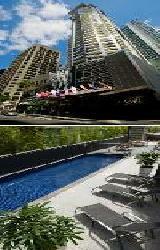 The Rydges Southbank Hotel is ideally suited to both the leisure and business traveller. Luxury apartments complemented by a fabulous array of guest facilities is what makes the Macarthur Chambers Apartment Hotel Brisbane stand out from the rest. 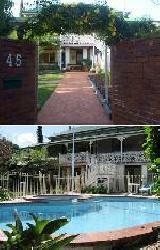 This fantastic Brisbane property is housed in a unique heritage building which is full of World War II history and memorabilia. Choose to stay in either one of our spacious 1 and 2 bedroom apartments, all of which feature a fully equipped gourmet kitchen, luxurious bathrooms with spa bath, air-conditioning, double glazed windows, full laundry facilities, TV, DVD and CD player. 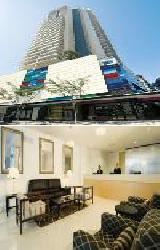 The Macarthur Chambers Apartment Hotel provides luxury Brisbane accommodation right in the heart of the CBD. Everything that you need including shops, restaurants, cafes and nightlife are all within walking distance of our apartment hotel. Step back in time whilst enjoying luxury property with all of the modern conveniences of today's society. If you are a corporate client requiring a luxurious but convenient Brisbane location, or a couple looking for a romantic getaway, the MacArthur Chambers Apartment Hotel Brisbane will suit the requirements of even the most discerning of travellers. The Republic Apartments provide Brisbane accommodation that is excellently positioned in the central inner hub of Brisbane. Offering fully furnished and self contained apartments the Republic Apartments in Brisbane are also conveniently adjacent to village style shops, supermarkets and restaurants, as well as being less than a 9 minute walk to the Queen Street Mall in the Brisbane CBD. The Founda Gardens Apartments Brisbane is a luxury highrise apartment building 1 ½ kms from the central business district of Brisbane. Our spacious apartments are situated close to Wesley Hospital, Park Road coffee shops, Milton and Coronation Park business districts, Regatta Hotel and the Brisbane River. We are also lose to buses, trains and the Citycat ferry which provides you will easy access to the Brisbane CBD and other tourist attractions. The Brisbane apartments at the Founda Gardens are ideal for corporate travellers or families needing the extra space whilst on holidays in Brisbane. Located at the doorstep of this Brisbane accommodation is some of the city's favourite cafes, restaurants, boutique shopping and Suncorp Stadium the Central Cosmo Apartments is a convenient place to stay. Positioned on trendy Park Road this Milton acommodation is also just minutes from the CBD and overlooks the charming Brisbane River. Offering a mix of studio, one and two bedroom apartments, the boutique Central Cosmo Apartments caters to the needs of both business and leisure travellers alike. Guests staying at the Central Cosmo Apartments can enjoy the facilities and features of property including a sauna, outdoor spa, free secure car parking, business services, onsite restaurant, laundry service, room service and tour desk. The M on Mary Apartment Hotel is the perfect choice in affordable Brisbane accommodation for your next corporate trip, romantic getaway or family holiday. Newly opened in 2008, this modern boutique apartment hotel is perfectly situated in the heart of the Brisbane CBD and featuring a range of 1, 2 and 3 bedroom serviced apartment spread out over 43 levels. The M on Mary Apartments combine outstanding customer service, luxury hotel facilities and the spaciousness of fully self-contained apartments. The M on Mary apartments feature the very best in finishes and appliances including ducted air conditioning, granite bench tops, fully-equipped kitchens with stainless steel appliances, private laundry facilities, private bathrooms with spa baths, luxurious King size beds, Free Foxtel TV, DVD players and wireless high speed internet access. This exceptional array of in-room facilities, along with an outdoor heated pool, barbeque entertainment area, gymnasium and sauna, makes this Brisbane property ideal for the discerning corporate and leisure guest. 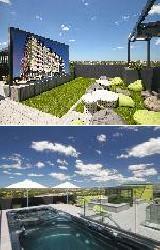 Taringa Gardens Apartments Brisbane is your gateway to Brisbane's West. Conveniently located close to Suncorp Stadium, Indooroopilly golf course, the Wesley hospital and medical centre and the Brisbane boys college. 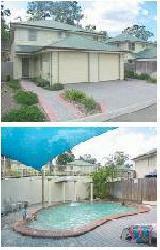 This accommodation in Taringa comprises of fully self-contained apartments featuring full kitchens and laundries. All of our well appointed apartments have reverse-cycle air conditioning and their own private balconies or courtyards. 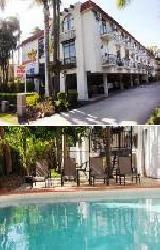 The apartments overlook a beautifully landscaped garden and pool area, and there is a BBQ area for all to enjoy. 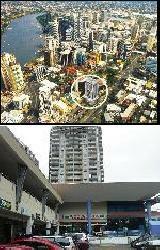 Public transport is close to hand making access to Brisbane CBD and the Milton and Toowong Business Districts very easy. Complimentary undercover car parking is available at the property. The NEXT Hotel Brisbane provides luxury rooms that are centrally located on the Queen Street Mall in the heart of the Brisbane CBD. 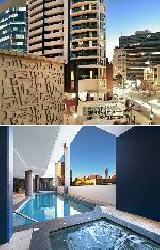 This makes it the perfect Brisbane accommodation for the discerning leisure and corporate traveller. The NEXT Hotel Brisbane is ideally positioned close to the new Brisbane Convention and Exhibition Centre, South Bank Parklands, the Queensland Art Gallery, Brisbane Botanic Gardens and is also the closest hotel to Treasury Casino. The accommodation at this Brisbane hotel ranges from Deluxe and Executive hotel rooms through to 1 Bedroom King and Superior Spa Suites. 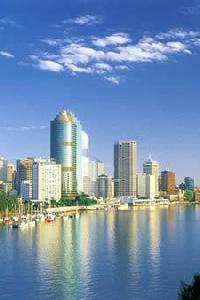 Most of the rooms come complete with panoramic views of the Brisbane city skyline. This luxury Brisbane CBD Hotel offers an excellent range of facilities including restaurants, bars, heated outdoor swimming pool, spa, masseur, sauna, room service, tour desk, guest laundry, airport transfers, daily housekeeping and secure undercover car parking. Brisbane Manor Hotel is a great value home away from home which prides itself on offering some of the best budget accommodation in Brisbane. Located in the heart of the city the Brisbane Manor Hotel is walking distance to China Town and some of the best pubs, clubs and restaurants that the city has to offer. 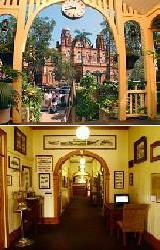 This budget Brisbane accommodation is housed in a fantastic heritage building with a leafy green veranda, waterfalls and sundeck bar. 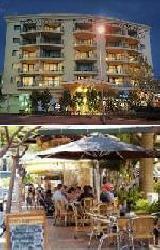 The valley nightlife is on your doorstep when you stay at the Brisbane Manor Hotel. The hotel rooms at the property range from Single Standard and Double hotel rooms right through to the Superior Queen and Deluxe King hotel rooms. With fantastic, friendly staff and spotlessly clean rooms in a charming, heritage building this Brisbane property has all the facilities that you need to have a wonderful holiday experience. The city of Brisbane and the surrounding suburbs and regions have lots of different places that are ideal for long or short term stays. This includes the Brisbane Marriott Hotel, Riverview Hotel Brisbane, Conrad Treasury Hotel Brisbane, Hilton Hotels Brisbane, Sofitel Brisbane Hotel, Stamford Plaza Hotel Brisbane, Brisbane Holiday Accommodation Village, Novotel Hotels Brisbane and the Springwood Tower Apartment Hotel Brisbane. In order to book in at these or any of the other hotel accommodation in Brisbane then click here to make an enquiry.